We in MCAD’s Sustainable Design Program are as proud as peacocks and happy as clams. This week one of our amazing students, Kendra Hargens, makes history at the Minneapolis College of Art and Design (MCAD) as the first student to graduate from the Master of Arts in Sustainable Design Program. She also creates a new benchmark in MCAD’s 125-year history as the first online student to “walk” at MCAD’s commencement ceremony. We are so proud of you and your inspiring sustainability work, Kendra! Kendra Hargens has a strong background in fine art and design and is the first graduate of MCAD’s MA in Sustainable Design program. She has been working on the soft goods industry for the past 6 years and is passionate about incorporating sustainability into mainstream design and manufacturing processes. 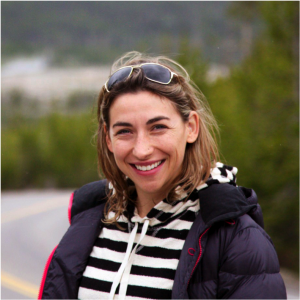 She is currently Senior Designer at Lowepro Wordwide, and a member of the Outdoor Industry Sustainability Working Group, which brings together outdoor businesses whose first accomplishment was collaboratively developing the industry’s first environmental assessment tool: the Eco Index. Kendra has been a pioneer in MCAD’s MA program, in more ways than mentioned above. Kendra demonstrated that it is possible to live in California, work full time as a Senior Industrial Designer at a leading soft goods company all the while going through MCAD’s fully online MA program. During her tenure she completed an affordable design project as part of her Graduate Sustainability Practicum for a small business client based in Kenya while working with a supervisor in Michigan and an course instructor in Montana. Her inspiring work with Baisikeli Ugunduzi is not only helping the Boda Boda (bicycle taxi drivers of Kenya) improve their “rides” but also went on to be featured at the 2012 annual Association for the Advancement of Sustainability in Higher Education (AASHE) conference in LA in October 2012 as part of an exhibit presented by the Partnership for Academic Leadership on Sustainability (PALS) group. 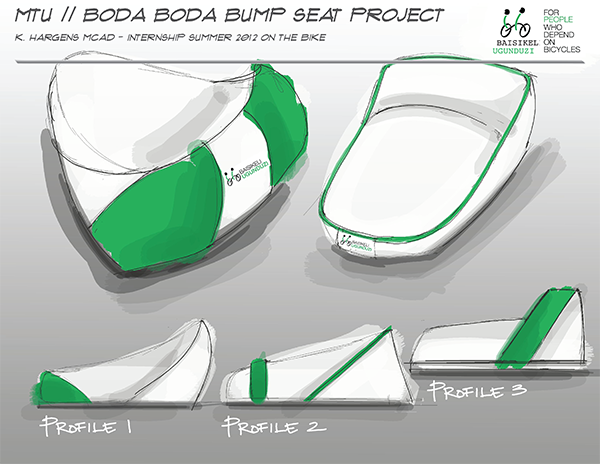 Kendra decided to create a practical tool for soft goods designers for her Graduate Sustainability Thesis Project. She developed an interactive and visually-organized website concept that will serve as a clearing house database for information to inspire and inform soft goods designers about sustainable products, textiles, companies, etc., as well as a place to connect with fellow sustainably-minded designers. We can’t wait to see this site go live. Best wishes to you, Kendra. 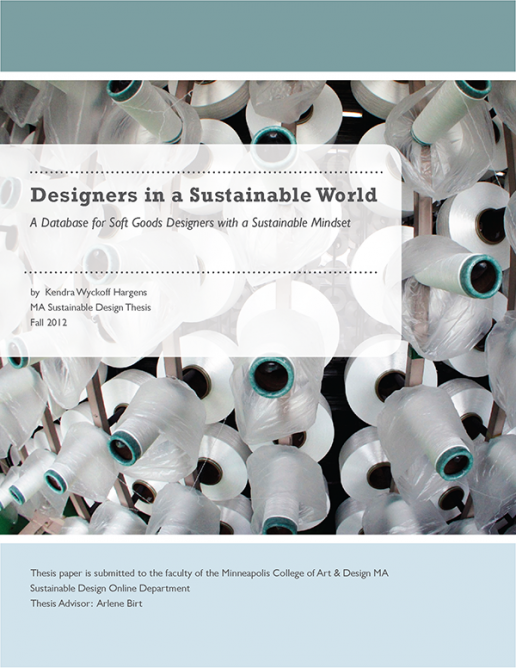 You’re not only a pioneer in MCAD’s MA program but to the sustainable soft goods industry as a whole. We look forward to watching you blaze trails. Kendra Hargens has a strong background in fine art and design and is the first graduate of MCAD’s MA in Sustainable Design program (2012). She has been working on the soft goods industry for a decade and is passionate about incorporating sustainability into mainstream design and manufacturing processes. She is currently a designer with Fox Racing and was formerly a senior designer at Lowepro Wordwide. She is a member of the Outdoor Industry Sustainability Working Group, which brings together outdoor businesses whose first accomplishment was collaboratively developing the industry’s first environmental assessment tool: the Eco Index. Kendra is based in California.